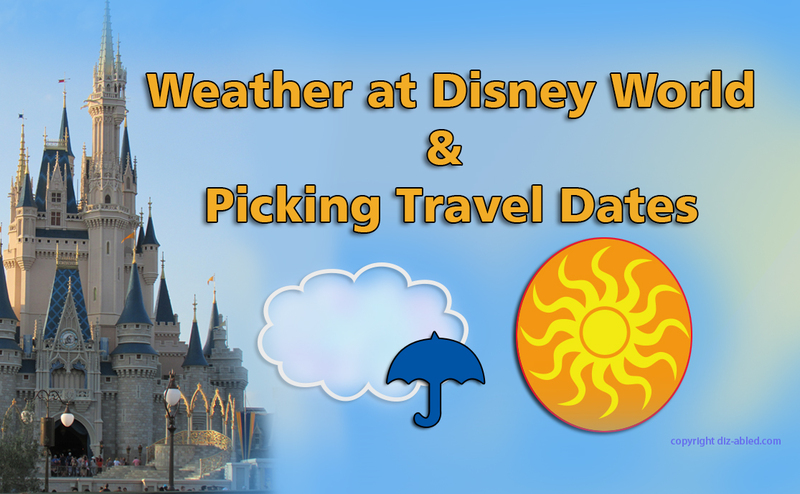 Planning on how to pack, plan your days, and cope with weather changes while you’re at Disney World. On this page we’ll deal with picking your travel dates in light of weather. For those who don’t care to read the “why’s” of everything, we’ll give you our picks first, and then we’ll explain in detail below. Remember that this is just about weather. 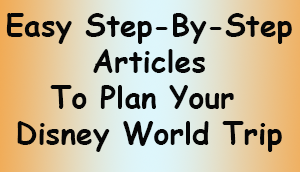 For picking optimal dates, you’ll need to also look at the crowd conditions, holidays and special events at Disney World. In addition to reading this page, you’ll want to check out our calendars for each month, with day-by-day weather conditions, special events and crowd conditions. March, April, and early May – Of course there’s no guarantee, but in our opinion, the most comfortable temperatures combined with drier days seem to be around March, April, and early May, before hurricane season. For many people it’s warm enough to swim comfortably in the Disney resort pools or water parks, but moderate enough to enjoy the outdoors comfortably. Remember though that temperatures can vary. Early May can become warm, and March and April can have cool periods. October and November – In addition to the above months, we also like October and November, though there’s still the possibility of a hurricane. November tends to have less hurricanes than October, so it might be a better pick. The daytime weather tends to be mildly warm and there tends to be much less rain than in summer. The further you get into October, the the more mild the temperatures tend to be, and the less likely it is to be very rainy. The high and low temperatures can vary, but typically we see very comfortable and moderate high temperatures and dryer weather. December, January, February – If you don’t mind the cooler weather, you’ll be likely to have dry weather throughout your visit, though there’s no guarantee. If there is rain, lightning storms are rare in these months, and it’s not hurricane season. If you have health issues that could be impacted by heat, avoid coming during the warmer months and stick to the more mild or even the cooler months when temperature tends to stay in the low 80’s or below. Keep in mind that humidity can make even moderate temperatures seem much higher. It can be humid all year round in Florida, but the winter months tend to be drier while the summer months tend to be very humid. If a member of your party will be using a wheelchair or scooter, it’s so much easier if there’s less rain. You may want to stick to the driest seasons mentioned above. Central Florida weather can have positively glorious weather, or it can be brutal, uncomfortable and even miserable – depending on your point of view. If you have any flexibility with your travel dates, consider factoring the weather into the equation. If you have health concerns that could be impacted by weather, it’s even more important to time your trip with more mild weather. The hottest, wettest months: June, July, August and much of September are usually intensely hot, humid and rainy with almost daily thunder storms. It is also hurricane season (see below). 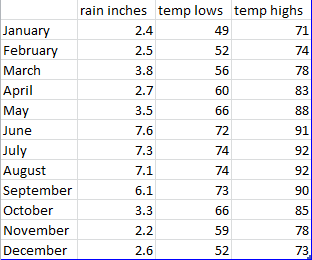 Mildly warm days and cool/cold nights: March, April, October and November tend to have pleasant and mildly warm days with cool/cold nights, with much less rain than the summer. Unpredictable temperatures but generally cooler and dry: December, January, and even February can be surprisingly cold at times. Mornings tend to be chilly or even cold, and afternoon high temperatures are unpredictable. Some days warm up by the early afternoon to beautiful, mildly warm temperatures. Other days will be cool or even cold weather worthy of winter coats. The driest months: Given in order from highest to lowest rainfall are November, January, February, March, December, and April. Hurricane season runs from the beginning of June through the end of November. September has historically been the most active month for hurricanes. August earns second place. June and November are generally the least active. Sometimes we go for years without a hurricane hitting Florida, and sometimes we get multiple strikes. Since Orlando is inland, the hurricanes have usually been much less powerful than what you would experience in the coastal areas. From what we’ve seen and heard, Disney is well prepared to support guests during and after a hurricane. Depending on the damage done, the parks may close temporarily, and there’s no telling for how long. Personally we either avoid visiting Disney in the summer, or we go with realistic expectations of what we can and cannot do, given the weather (and crowds). Still we believe you can have a fun trip under most weather conditions at Disney World, especially if you’re in good health and hardy. However we personally find that the summer weather does tend to reduce our “fun factor”. 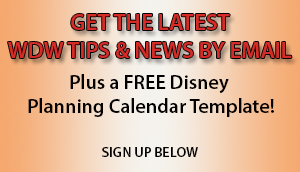 If you plan to visit Disney in the warmer weather, check out our article called Managing Sun & Heat Sensitivity at Disney World for tips on how to stay more comfortable and safe. Rain storms: During June, July, August and much of September it will typically rain nearly every afternoon. Usually this rain is a temporary event, lasting 20 minutes to a couple of hours. It’s often accompanied by thunder and lightning. Once it clears the weather can be clear and cooler (though still hot). Occasionally we get unrelenting rain. The good news – Some people don’t mind the storms. One benefit of rain In the parks is that people tend to crowd into doorways and shops during the rain, leaving walkways fairly empty and ride lines shorter. Some people even leave the parks. As long as there’s no lightning, this is a good time to move around the parks. Some people like to put on ponchos (available at all Disney stores), and enjoy the parks while the crowds have thinned out. Keep in mind that your feet and legs will probably get wet, and the ponchos can make you warmer. If there is lightning, you’ll have to take cover. Also some rides will stop operating, and anyone in a Disney pool or water park will have to leave the water. The water parks may even close if the lightning storm is expected to last. Sure, winter weather in Central Florida is generally much warmer and nicer than much of the country and even the world. I remember stepping off the plane from Connecticut the first time I visited Florida in the winter, and reveling in all the green trees and grass. Yet it was cold and I had to wear my winter coat. Who knew? 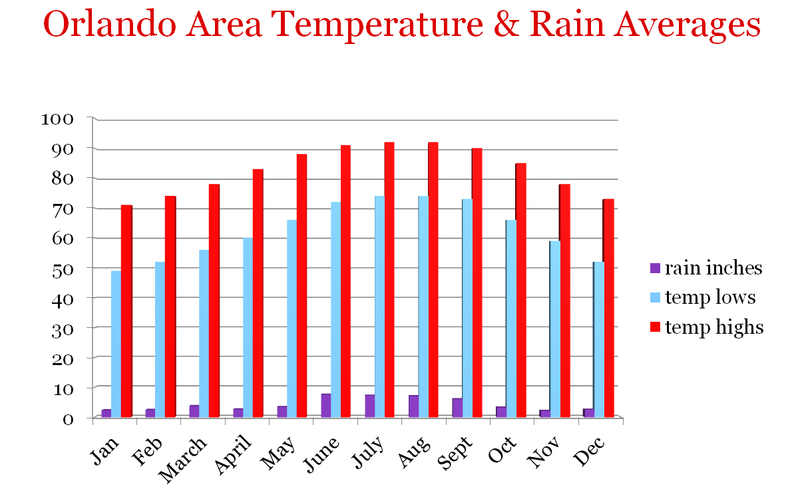 The winter temperatures are unpredictable, but winter tends to be much drier with only occasional rain. There are times you’ll need a winter coat and gloves at Disney, and at other times shorts and tee shirts will be appropriate. Nights are significantly cooler than days during fall, winter and spring. The weather can change by 20 degrees or even much more during the course of a day and evening. Freezing temperatures are infrequent but possible. Keep in mind that on those colder winter days, Disney doesn’t usually provide heat in the attractions queues, however there’s heat available in the resort rooms. They sometimes utilize standing radiant patio heaters in areas such as some outdoor restaurant seating areas, and we hear that they’re starting to use these in some ride queues as well. Because temperatures vary in the fall, winter and spring, you may need to pack both cool and hot weather clothing during those seasons. If you don’t mind that, then the winter could be a good time to go. There tends to be very little rain so you’ll have good odds of not having rainy days. NOW IDEALLY, YOU’LL WANT TO CHECK OUT CROWD CONDITIONS and sync it UP with the best weather conditions.